This is our custom-built TS to TS Unbalanced line cable or Guitar and Instrument cable (TS is 1/4" mono or unbalanced connector). Construction is Neutrik TS connectors with Canare GS-6 cable. Neutrik connectors are some of the best connectors around. 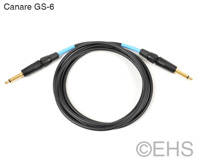 Canare GS-6 wire is among the best wire, used in the best studios for its ultimate sound qualities and durability. Canare GS-6 cable is very flexible, durable, heavy-weight cable with a 92% coverage braided shield and carbon sleeve. Photo 2 shows the two ends with black-gold straight connectors.